Christmas is a time of great joy but winter holiday season is busy time on the highways. Families are going on the road to join loved ones. Students are driving out of the campuses to get back home for the long anticipated winter break. Business travelers are finishing with their travels and are making home. Tourists are hitting the road for a Christmas holiday getaway. 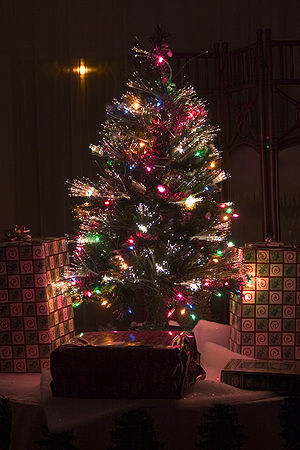 All are in hurry to join the closest friends or family members and celebrate around the Christmas tree. Safely secure your Christmas tree. One of the joys of Christmas is to have a Christmas tree. If you buy one make sure that it is securely fastened in your trunk or on the roof. If you bought artificial Christmas tree it will come in some kind of box so you can safely transport it in your trunk or even on the back seat. Fibre optic treeswas very popular last season, because you just need to take this tree out of the box, set it up and turn it on. Check your car. Winter driving is hard for you and your car too. Check your car battery and use your winter set of tires. Cold time can harm both, a car battery and the tires too. While checking your car make shore to check your windscreen wiper blades. We advice this as a separate tip, because many people forget how important they are in the winter. Winter days are short. Make shore to leave early so you can arrive on your destination before night fall. Remember – you are going on a holiday, straight from the working day so you are tired and clearly your concentration is not the best. Start your trip with ZERO alcohol in your body. Sometimes even the smallest amount can harm our abilities and reaction time. In many cultures around the world people are decorating their cars. Make sure that any decorations you put on the vehicle do not impede your view of the road. We hope you will not need this, but if you go on the longer trip, make shore you have at least few big bottles of clean drinking water and some high calorie food in case you are stuck in the long column of vehicles. We hope you already know this. Many times even if we know something we do not act and reminders are useful. This few tips were brought to you by Rudolph’s Christmas Shop from Melbourne, Australia.